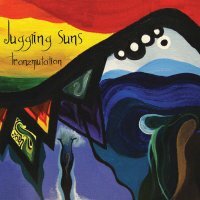 Tranzmutation is the latest evolution across the sonic universe of Juggling Suns. Featuring Mark Diomede: Guitar/Vox, Gus Vigo: Keys/Vox, Ken E. Kruise: Bass/Vox, Tim Morris: Rhythm guitar/vox, and Andrew Lenaghan: Drums, Juggling Suns' unique style of cosmic dance music has been astounding audiences from New Jersey to Japan for several years and the band is well poised to make their cosmic contribution to the ever evolving jam band scene. Point Pleasant, NJ based Juggling Suns was initially discovered by Johnny Z, the legendary A&R guru/indie mogul who signed Metallica, Kings X, the Disco Biscuits and Warren Haynes among others. His NJ based label Megaforce was among the most successful independent labels ever, and while Johnny Z will have eternal bragging rights for bringing the world Juggling Suns, Asbury Park based AERIA Records is equally proud to bring them back. "AERIA Records is profoundly delighted to support the latest chapter of Juggling Suns long strange trip and prodigious musical career" says AERIA Records CEO Coleman R. Brice. The group's roots extend back to the legendary N.J. band Solar Circus. Originating as a Grateful Dead cover band, the group evolved into without question, the most sought after original band along the Jersey Shore. Over the years, the band released five albums internationally, were featured on several compilations, and toured nationally - sharing the stage with everyone from Tom Constanten, The Radiators, Widespread Panic, Hot Tuna and Bruce Springsteen (on the actual day Jerry Garcia died), among many others. The band has also appeared in the feature film "Runaway Bride" featuring Julia Roberts and Richard Gere. Juggling Suns has also been featured in the New York Times. A limited edition advance version of Tranzmutation will be available exclusively at the Juggling Suns April 14th appearance at The Stone Pony in Asbury Park. The band is also performing warm up dates for an extensive Summer/Fall 2006 club, amphitheatre, and festival Tour. Please visit: aeriarecords.com or www.jugglingsuns.com for additional information. AERIA Records is an artist led venture seeking to expand and preserve the NJ shores legendary music scene. Recent releases include the incredible debuts of teen prodigy Brian Amsterdam, Long Branch, NJ based producer St. Christopher, and Agency (formerly known as Republic). Upcoming efforts include releases by Rick Barry, Jon Francis, and Hollywood, California based Candyland Riots!